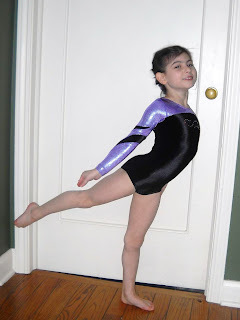 In addition to all of Aaron's issues, we have been busy with Genevieve's gymnastics schedule. Here she is in her pretty team costume: She has been to her first two meets now, both in the Buffalo area. The first one she was so nervous that she forgot parts of her routines (which she normally can do in her sleep). She ended up with poor scores as a result and was very upset when she saw all the other girls getting awards and she got "a handful of nothing". I felt so bad for her. She just sobbed and sobbed. 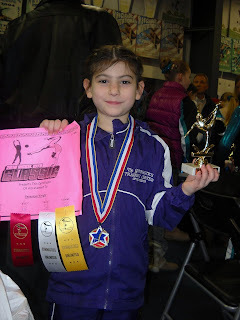 The next time, though, she did much better on those two routines and ended up winning 3rd place for her level/age bracket in bars and 5th place all-around. Man, was she proud! She has showed off that medal and trophy to everyone who has been to the house since, as well as anyone she talks to on Skype. The kids really get along quite well...most of the time. 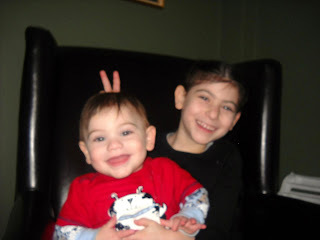 Aaron has gotten to the age where he gets into everything and so is starting to become an annoyance to Genevieve at times. He would much rather investigate her stuff or go through the kitchen cabinets than play with his own toys. A couple of weeks ago Genevieve wrote a journal entry about how she hates her brother. And then a day or so later she relented and wrote that she really does love him. Sometimes I hear her muttering nasty things about him and then other times she giggles about how cute he is. Ah, siblings! Well, of course it's winter in Rochester, which means lots of snow. It's been a long, cold winter, and we can't wait to see the end of it. At least it's not dark as much as it was in December. 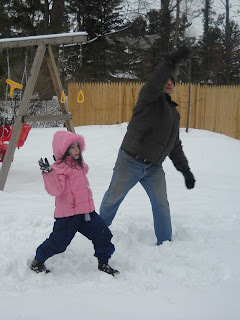 Yesterday John gave Genevieve a lesson in making and throwing snowballs. They even made a snowman but haven't given it a face yet (distracted by hot chocolate, I think). 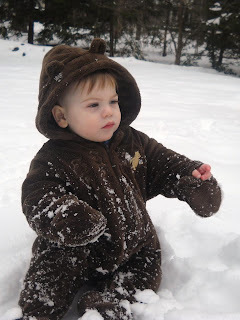 My little bear got into the act for a while too. He seemed to prefer watching from the window, though. A boy after my own heart. This picture is from this afternoon. I just thought it was funny. 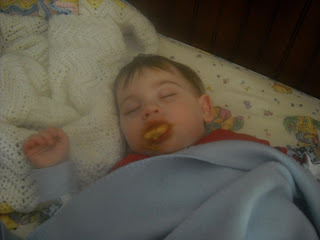 He fell asleep in the middle of eating a cookie. He didn't even drop it when I brought him upstairs and put him to bed.